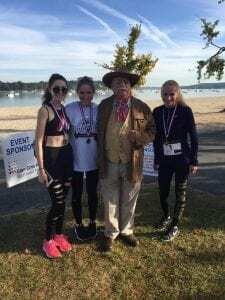 Approximately 80 runners and walkers participated in A Run Through History in Oyster Bay, NY in October, 2017. The event was a fundraiser for the HPS Network and another Oyster Bay, NY-based non-profit Peerpals.org. Peerpals.org helps preschoolers with disabilities integrate into their community through activities and play dates. Joey Bertolini, the son of long-time HPS Network volunteer Kerri Bertolini, won the race. Laura and Molly Friedman, daughters of HPS Network Director of Medical Affairs Valerie Friedman, came in second and third place respectively in their age groups. Thank you so much to everyone who participated and made A Run Through History possible!